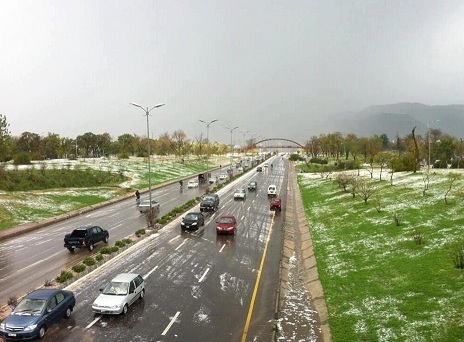 On March 14, the federal capital Islamabad was whitened from its colourful atmosphere that came as a surprise as a thunderstorm yielded intense hailstorm, the storm impacted major cities of northern Punjab. A Western Winds was responsible for the unusual turn in the event. Does it hail in Islamabad? Yes, hailstorm is very normal in Islamabad most people were confuse it with snow but the fact of the matter is that snowfall does not occur in Islamabad. The only place where snow occurs is the Margalla hills that is near the city where this snowy weather rarely visits! A hail is like a block of solid ice that are liquid in the air but becomes solid due to low temperatures. Snow on the other hand is watery flakes they occur only when the air near the ground is very cold to below freezing level. 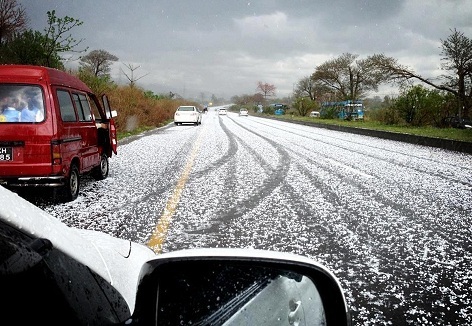 The other cities that received hailstorm included Rawalpindi and Lahore. In February 2011, an intense hailstorm occurred in Lahore that made the city experience the Murree environment. Sir snowfall does occur on the high points of the hills and pir sohawa in winter and it is not rare.it occurred in 2006,2009,2011and so on. Last time I checked, it was said that Margalla hills got snowfall after 6 years. Light snowfall occurs on Margallah Hills every few years ( not every year), but as far as Islamabad city is concerned you are correct. The Hills Mr. Ahmad is talking about are more than 4000 feet high and technically are not part of Islamabad city. in pir sohawa but margalla hills high points get snowfall.